There are many factors that may affect inflation. Also, the weights of certain factors may vary across countries. Take the development of the exchange rate, for example. 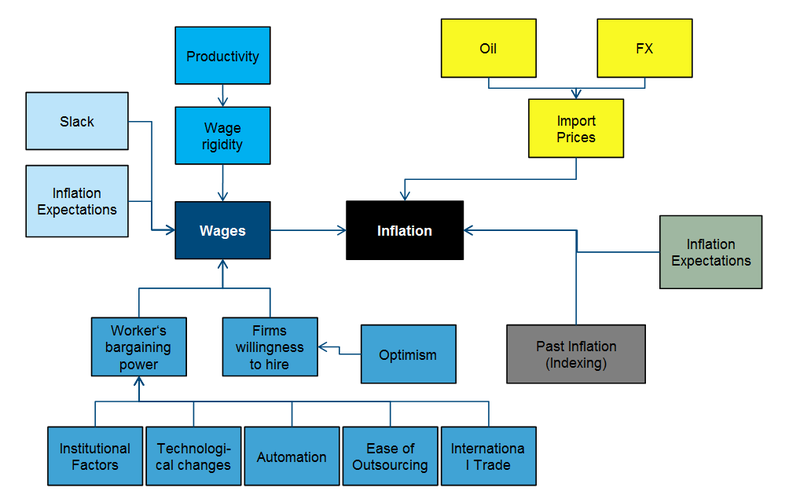 The following chart illustrates some of those inflation factors and underlying causal chains. But those are far from all. We left out dependencies between individual factors and feedback loops. This looks complicated. How do you approach the development of inflation in a specific country? We always start out from a chart with historic inflation. The current rate of inflation is a good point of origin for an estimate of the future rate. And then, you quickly get a feeling for the essential drivers and the extent of their potential impact. Does inflation fluctuate around the average by +/-0.5% or by +/-5%? You also learn about the institutional set-up around inflation. What inflation history does a country have, and has there been hyper-inflation or deflation? The next aspect I would look into is what rate of inflation is expected in the short and especially long term. To this end, one can use numerous sources. What is priced into inflation-protected bonds or similar financial instruments? What do the central bank, commercial banks, international organisations, and economic research institutes forecast? What do businesses and consumers expect in surveys? After that, I would have a look at the cyclical factors. Among those are the stage the economic cycle is in, economic indicators that allow me to deduce the level of capacity utilisation in the economy, and lastly, wage development. The point is to find out whether to expect a fast increase in prices due to high demand or due to supply shortages, for example as a result of cost increases for certain raw materials. In addition, I would also look at global factors such as oil and import prices as well as foreign exchange developments. Lastly, there are also a number of factors that are less easily defined or quantified. What is the political climate like, what is the attitude towards certain economic issues, and how is the sentiment in the country? How is productivity developing? To what degree is the country in question exposed to international competition? What role do new, usually cheaper channels of distribution play? How many jobs are in danger due to technical progress, i.e. robots? I believe that nowadays these are the main factors that explain the inflation differences, which at this point are at rather moderate levels. Why was inflation in the USA that low in 2017 despite the good economic activity? In simple terms, the prices of services were up while the prices of goods were down. The prices of consumer durables such as cars, furniture, and white goods recorded a decline in 2017. The prices of services, on the other hand, have been on a constant rise over the past years – much like in 2017 – of more than 2% p.a. Within the service sector, the price development of the two heavyweights, housing and healthcare, has been quite divergent. Whereas housing has increased by more than 3%, healthcare costs have risen by 1.25% to 1.5%. Food and energy prices have been the wild card. They are substantially more volatile than the other components of the basket of goods. While food prices were up only slightly in 2017, energy prices soared by 15% y/y. But this can change quickly. Exactly one year ago, the referential value was -15%. What are the influencing factors that the development of wages generates in this context? The development of wages is of course an important topic. Despite the progress in robotisation, every company employs people and pays them wages. Human labour remains the most important input factor of the production process. When wages decrease or increase, inflation echoes these movements. At the moment, wages are an important topic of discussion in the USA. On the one hand, wages seem to rise only slightly despite the positive economic performance, on the other hand some people claim that wage increases are not measured correctly. What is your point of view? Let me start at the bottom. Are wages rising or not? This question is, like any other question regarding measurement, ultimately very technical. And, if you know the details, it is far from trivial. The Federal Reserve Bank of Chicago, part of the US central bank system, has recently published a paper where it calculated wage increases of 2.8% to 5.1% from the same set of data. A substantial bandwidth, given the current inflation rates. Where does this wide margin come from? When calculating the average wage increase, one has to answer three questions – and depending on one’s answers one will get different results. The first question is what wage earners one uses in one’s model – all, or only those who were working gainfully the previous year as well. In one case, one measures the change in wages earned by all wage earners, i.e. the aggregate amount of wages paid by companies, and in the other case, one measures the increase in wages received by those people who were gainfully employed throughout the measurement period. The second question one has to ask is about the kind of average used: the arithmetic mean or the median. The median reacts less significantly to outliers than the arithmetic mean. The last question is whether to weigh all wage earners equally or whether the amount of wages paid is to play a role as well. Changes in higher wages affect the aggregate wages paid by companies more strongly than the same percentage change of lower wages would do. The bandwidth of (in our example) 2.8% to 5.1%, then, hinges on the answers to these three questions. What does that mean? Are wages (is the rate of wage growth) currently growing in the USA or not? Average hourly wages (all wage earners regardless of whether they were employed at the beginning of the period; arithmetic mean; equal weighting) in the USA have recently increased by 2.5% y/y. In view of the extremely low unemployment rate, this is very low. I believe that part of the reason for this low value is the fact that due to the low unemployment rate, mostly those people are finding jobs who previously were unable to do so due to their (lack of) qualifications. They tend to receive low wages and thus weigh down average wages. This is also reflected by the fact that a large number of the jobs recently created have been mainly created in sectors that would hire low-skilled workers, and it is further supported by the fact that the wages of those people who were in employment last year as well are growing by a rate higher than 2.5%. Also, due to the demographic development in the USA, the average age of wage earners is falling. Older workers who earn more due to experience are dropping out of the basic sample at disproportionately higher rates, which weighs down the average as well. Does this mean that wages are growing anyway in line with the economy and are only measured erroneously? Unfortunately, it is not that simple either. While wages are rising, the figures have so far failed to fully reflect the good economy. Also, one has to bear in mind that there are very good alternative explanations for the moderate wage growth. Some analysts claim that the US labour market is not as strained as the unemployment rate would want to make us believe, and that a part of the unemployment is just not being measured. I personally do not think that is the case, because alternative concepts of measuring unemployment show that these hidden reserves in the USA have been largely exhausted. Some experts blame globalisation and China for the low wages. Here, I believe that the fear of outsourcing and of job losses does exert a dampening effect on wages and their development. However, the direct effect is at the lower end, given the low volume of imports from China: only 2% of the basket of goods in the USA originate in China. One factor that I also keep hearing is the rising degree of robots and artificial intelligence penetrating the economy. Here I am more sceptical. First off, one would have to see the ramifications of robots replacing humans more clearly in the productivity statistics; in other words, fewer people would have to be able to produce more goods. Also, the share of the economy where robots have “taken over” in the past 24 months is negligible. Another reason that is sometimes put forth in explaining the low wage growth at the moment are the stable inflation expectations. Consumers and businesses in the USA expect an inflation rate of about 2% in the coming years, regardless of the ups and downs of the economy. In such an environment, wages demanded and paid will also be considerably more stable than in the past. However, the labour market report released at the beginning of February and the most recent inflation data now suggest an increase in wage growth. That was also the reason for the market turbulences last week. All eyes on Washington: Will the Fed funds rate be raised?